Entrepreneurs, investors and thought leaders gathered at Miami Dade College, Wolfson Campus in October for an ambitious mission: finding innovative solutions to some of the most urgent problems troubling Latin American and Caribbean countries today. At “Demand Solutions Miami,” hosted by MDC and the Inter-American Development Bank, 18 entrepreneurs had the chance to present their own solutions for the multitude of economic and developmental issues plaguing that region. The event – which focused on the creative and cultural sectors, an area of industry that IDB has dubbed the “orange economy” – also included dozens of speeches from industry leaders, including DesignLab Miami Founder and Creative Director Angie Cohen, The UpCycle Project Co-Founders Annette Felder and Gabriella Smith, and IDB President Luis Alberto Moreno. According to IDB, were the orange economy a company, it would rank ninth in exports of goods and services and would represent the world’s fourth-largest workforce. The participating ventures presented innovative products or ideas to improve lives in the following categories: Design with Social Responsibility, Gastronomy as an Agent of Transformation, Multimedia to Save the World, Sustainable Fashion and Stereotype-Free music. 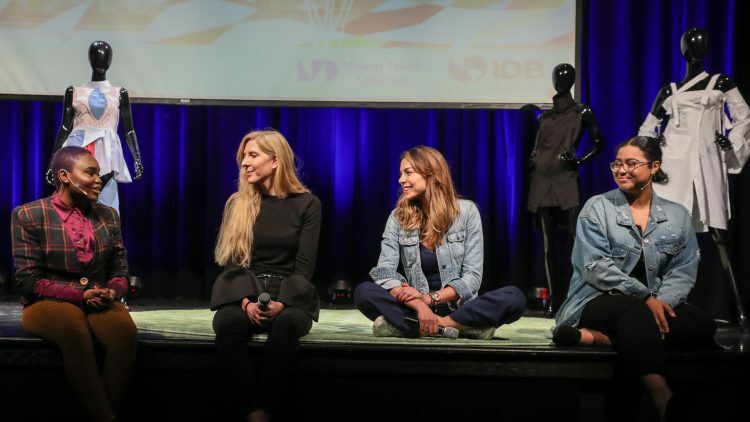 Although this is the fifth time IDB has organized a startups competition, Demand Solutions Miami was the first event to feature a majority of women-led businesses. Eleven out of the 18 startups featured, based across Latin America, the Caribbean and South Florida, have female CEOs. The Miami-based startup Caribu won MDC’s award for the most innovative startup in South Florida. Caribu functions as an app and marketplace allowing families to connect via video-call to read books and learn together in real-time, no matter where they may be located. As the United States’ gateway to Latin America and the Caribbean, Miami is strategically positioned to act as a creativity hub to that region. Miami is the now the top city in the U.S. for new business creation, according to the Kaufman Foundation’s 2017 Index of Startup Activity, which also found that 30 percent of all new entrepreneurs analyzed nationally were immigrants.